Creating an environment of music for preschoolers is one of the best things you can do for your child in the early stages. Collect a variety of music, and then push the play button. Let them listen as they play. Encourage them to move to the music. Talk about what you are hearing. I love Sergei Prokofiev’s Peter and the Wolf for teaching the different instruments. This is especially appealing to children named Peter. As a vocal performance major, we studied everything in the original language, and I can honestly say that I picked up more foreign vocabulary from the music I memorized then from the German and French 1010 classes I took. If you want a good overview of opera in the original language, I recommend "Opera, a new way of listening" by Alexander Waugh. I also thought the book itself was very good. Some of the songs on the CD are the complete song, while others are samples, but since our little children have short attention spans, I find the samples are usually long enough. Having said that, opera was always written in the vernacular tongue and was meant to be understood. I don't think that it is necessarily detrimental to listen to it in English. After all, these operas are often performed in English. I think that's a personal preference, the important thing is exposing them to good quality music. For singing, I have to recommend the Kodaly method. See my full essay on the Kodaly Method here. I actually got my degree in music and have had a lot of experience with children, and have been really impressed with it. 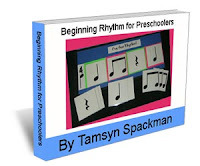 It starts out for toddlers using authentic singing games and nursery songs. It teaches music reading through solfeggio (Do Re Mi, etc) before pitch names so the children can sight-sing music. It teaches in the sequence that is easiest for children to sing, beginning with Sol and Mi, gradually adding notes until they know the whole scale. They also teach rhythm using french rhythm solfege, which I have found to be particularly effective with my piano students. I highly recommend the book The Kodály Method: Comprehensive Music Education from Infant to Adult by Lois Choksy. It is full of great ideas for teaching music to children, including several songs great for teaching in the back. I use a lot of Kodaly in my studio. Ideally toddlers would have a 5-15 minute lesson every day to fit their attention span, and I think this is the best time to start. I've been teaching piano for 10+ years now, but have been wondering how I'll teach my little boy. In my research, I found Piano for Preschoolers. I really liked the idea of color-coding for little kids, but this wasn't very practical for my studio, so I made my own color code chart to slip behind the keys on our piano. An octave is 6 1/2" on the piano, so I made a table in microsoft word with 7 columns and 7 rows, and made it 6 1/2" wide. I put the letters CDEFGAB in it and printed it out on cardstock. Then I colored all the C's pink, the D's yellow, E blue, F orange, G green, A purple, and B brown. I made this order up because it gave the best contrast, in my opinion. Putting red and orange next to each other gives more room for confusion. I cut these out and used clear boxing tape to laminate it and make one long strip to put behind they keys. You can also laminate them after you color, and then just use scotch tape to connect them, which was easier for me because I have a laminator. My youngest piano students are 6 and 7, and they were very excited when I gave them one. Then I had my students color the notes in their songs. This has been very helpful for a couple of my students who had become too dependant on finger numbers. One student told me it made her music pretty. For a toddler, I would color the notes for them. Most piano teachers have a favorite method, and mine is the John Thompson course. It is a more classical approach then the newer methods, and I find my students progress with it more quickly. Although the music is still the same, they have updated their Teaching Little Fingers to Play book so that it is not such small print, and they have fun colored images for each song. It also has a lot of tips for the teacher. The method has been around long enough I have found this book at thrift stores, but it is only about $7 new. When I start my little boy on piano, I am going to use this method and use a color-code chart to make it easier for him. My best advice is to follow your child's lead, and if he doesn't seem ready don't push it. I do know that in Suzuki they start kids as young as two, and one of the biggest ways they motivate their children is to have the parent also play. If you play already, great, do it! If you don't, the Suzuki method has you take lessons that your young child goes to for a few months before they get to take their first lesson, so they really want to do it. I don't think my son is quite ready yet. I do give him plenty of opportunity to tickle the ivories, but I have not given him formal lessons. I have a collection of percussion instruments I let him play with, and mostly right now I'm doing singing things with him. The suzuki method includes a lot of listening, not just the CD's of the songs they play, and they recommend you start that much younger, even at birth. I highly recommend "Nurtured by Love" by Suzuki to anyone who is interested in teaching their very young children music, even if you don't want to use the method. It's a short book, and was very inspirational. If you are going to purchase musical instruments, toys or otherwise, for your children, I offer a bit of wisdom I have learned through my own experiences. Please, please, please don't give them an instrument that won’t play in tune! Young children will sense that what they are playing doesn’t sound right, and they will become discouraged at their own ability to play that instrument well. Children are not likely to blame the instrument unless they have had experience with a better product. For example, when I was small and had shown quite an interest, my parents found a "bargain" and bought me a recorder. I was so excited to play it, but became discouraged because I couldn’t get it to sound right. I gave up on the recorder. This impression would have remained permanent if I had not had recorder lessons as part of an Orff course I took as a music major in college. They provided nice recorders as part of the tuition and talked of the importance of getting a good instrument. I quickly learned to play, and have had a lot of fun with my children with the recorder. On this note, avoid colorful xylophones at department stores. They don’t make them like they used to. I saw one the other day on sale for $15, and would have snatched it up it I hadn’t played the scale first. Yuck! When I told a neighbor that I could have bought junk on sale for $15, he told me that he gets junk for free in the mailbox every day. Heed his wisdom. A good plastic recorder costs about $5.00 USD at a music store. I have seen two recorders in a package at the dollar store. A bargain? Absolutely not! I have seen unpitched percussion instruments at the dollar store. A bargain? Absolutely! The point of percussion instruments is to make noise, experiment with sounds, and ultimately develop a sense of rhythm. Percussion instruments are a fantastic investment for your children’s musical development. One other note on instruments for children; make sure that the instrument is the right size for the child. I became discouraged taking much desired violin lessons because it hurt me to practice. My teacher said nothing about the size until my parents specifically asked her. It was much to big for me, and I took a four year break before I wanted to play again. My negative experience practicing with an instrument I desperately wanted to play created a mental block that was difficult for me to overcome. This lesson applies to every instrument that comes in children’s sizes. Find a musician that can help you find the right size. Ideally you would take your child with you to purchase the instrument. Rather than surprise your child with an instrument on their birthday, give them a coupon describing the gift and make a special shopping trip together. This extra step will be very rewarding for the whole family’s musical journey. Viva la Musica!